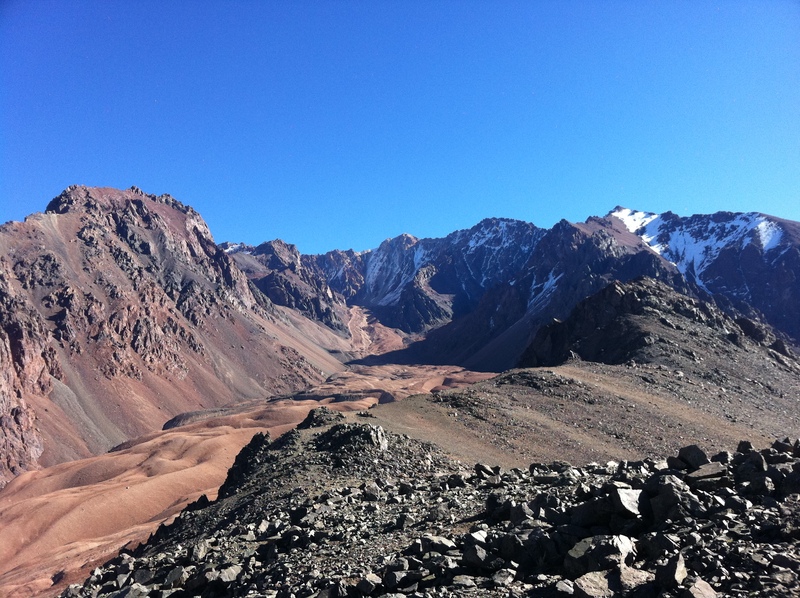 This is an excellent full day hike for those that want some physical activity but don't want to conquer Aconcagua or El Plata between asados and wine tasting. It is usually guided for tourists and therefore has little public information available, so I decided to provide some information on the hike because I couldn't find any on the internet the first time I went. This is for the "adventurous", but there is little risk of injury or getting "lost" there, (though it is quite high altitude so keep this in mind). To keep things simple, the best return is along the way you came. Also, remember to leave Mendoza early in the am so you have time to do the whole hike and be down before dark and bring plenty of water. First, drive to Vallecitos Ski Area parking lot from Mendoza. It is a long 1 hour to 1 1/2 hours from Mendoza by car. I will not give directions here, but it is straight forward if you ask around. Second, park your car at a safe place and walk up to the lodge. Facing the lodge and the mountain, on its right-most side is another small parking lot. From there you will see that the mountain is limited by a small ridge on the right that tapers back and around to the right. Go around the bottom of the ridge to the right leaving the ski lodge behind you. Stay on what is a primitive trail and stay high but not too high. Once you get to the ridge crest you will see that the trail descends into a gully. Walk down into it, staying high, following the trail and descending along the back side of the original ridge you saw from the lodge. As you wind down the trail into the bottom of the ravine, (stay on the trail and beware loose rock and unsteady footing at times), you will see a narrow creek bed that you can now begin to ascend. Follow that and the trail upwards. 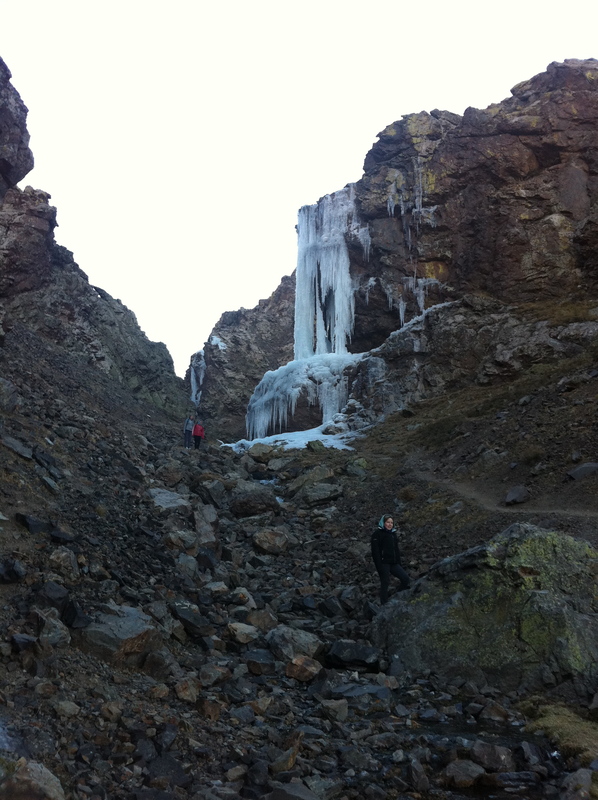 In colder months, this ice fall is created with piped spring water that freezes overnight. Pass these falls to your right as you ascend. Continue up the trail and the ravine will open into a grassy valley and you will see a saddle or low pass way up in front. Notice the spring water seeping from the ground all around you. I have drunk the water and have been fine, but there are grazing cattle around so be careful and take water directly at the source. Note that we are descending from the summit here, but you can clearly see the valley down below. This is the way you will be coming from as you head up to the pass I mentioned. Once you get to the saddle (about an hour from the car), you can go right to Arenales, (the lower summit), or up left along the ridge to Lomas Blancas. 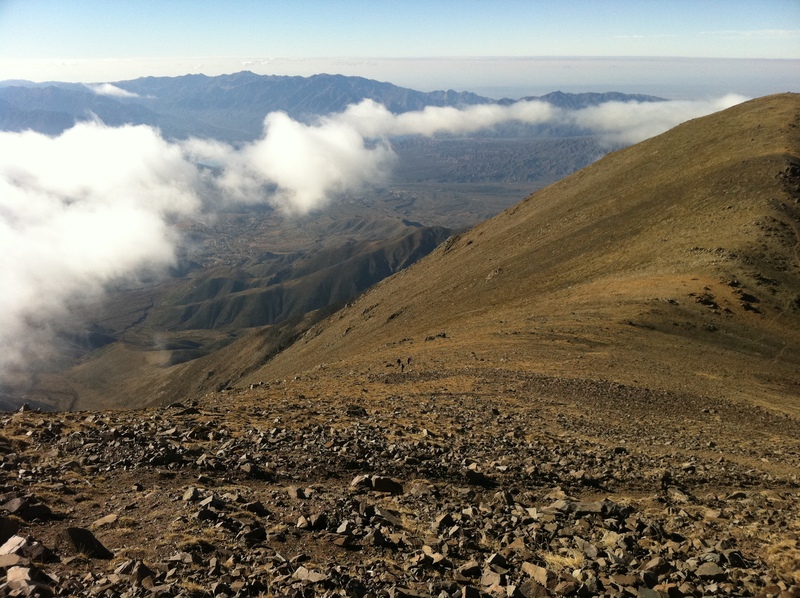 Here is a view looking down at the trail walking up the base of Lomas Blancas. Note, in the top right corner of this photo down below, you can see the Arenales summit. 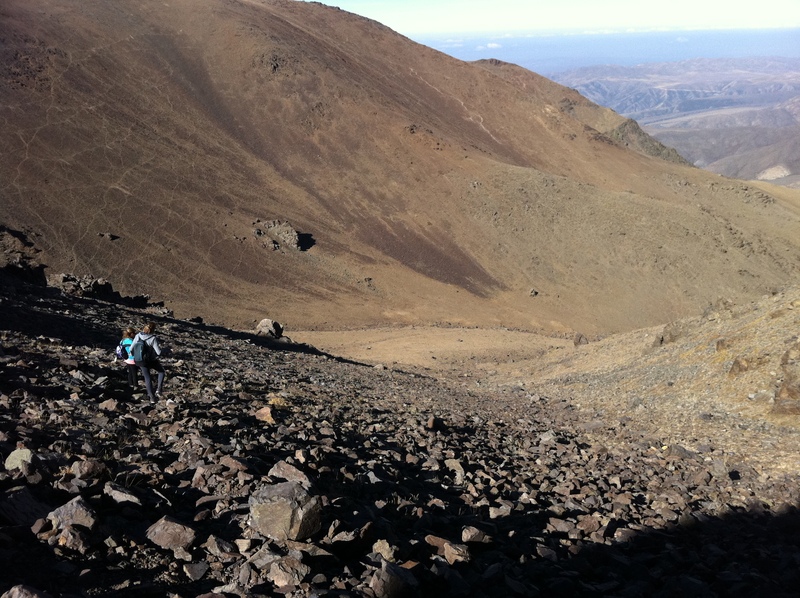 If you go up Lomas Blancas, continue left at the saddle and wind up through jagged rock to the top. It is pretty straight forward. Here is another view of the trail higher up. 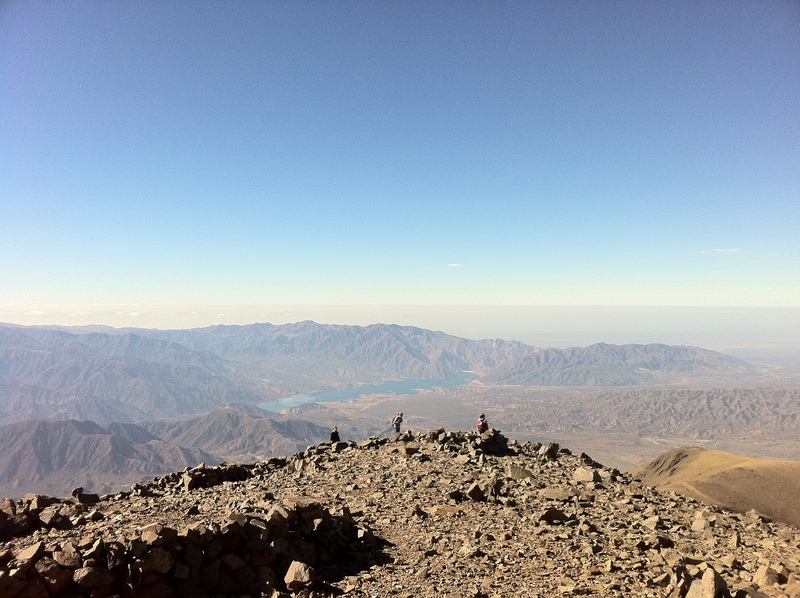 Once there, there is a great view of Mendoza and surroundings. 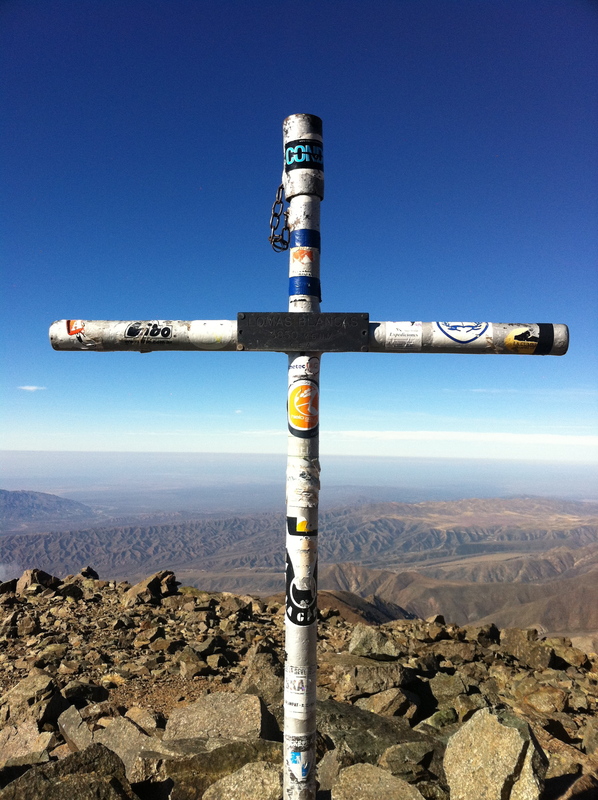 Here is a picture of the summit marker cross and the views you get. (3850 meters or about 12,631 FASL). Stick a Southern Wine Group sticker on the cross for us and send us a picture! Would be much appreciated. (To get free stickers, send an email to info@southernwinegroup.com). Getting home is the reverse of the climb up. Good luck, have fun and carry everything out, you carry in. Please stay on the trail and keep the trail nice for others. Look for Guanacos while you are there. They are usually around. On the way home, stop and see our friends at Jerome Brewery. Tell Eduardo that I told you to stop by, enjoy a beer and some great German food! Have Fun!